If you're looking to cut back your monthly outgoings, it's not always a case of cutting back your lifestyle. Making small changes to the way you do your regular grocery buying could save you more than you think. After all, it's one of your most common expenses, and small savings build over time. Make a list of everything you need before you go in and stick to this list, don't buy anything else no matter how tempting the special offers are. Make another list while you're in the store of things you want to buy next time. You can avoid purchasing on impulse by adding it to the list while you are already in the store. That way you won't forget about the item, but you have until next visit to be sure that you really need it, and you won't overspend on your current shop. Often bigger packages are cheaper per unit than smaller packages, but not always. Supermarket pricing can be confusing so make sure you compare the price per unit, especially on special offers. Use your phone's calculator if your maths is rusty. If it's not on your list, don't even pick it up. Supermarkets will fill your sightlines and walk-ways with tempting treats to catch your wandering eye, and if you pick something up and examine it, it's only going to make you want to buy it. The best things in supermarkets are often on the outside edge, rather than in the aisles. Fresh fruit, baked goods, fresh meat and fish are not only the healthy choice, but preparing meals from scratch is cheaper than buying prepared packets. Just because a certain brand is your favourite, doesn't mean you should get it. If there's a cheaper alternative, try that one instead. You can always return to your brand next time if you decide you can't settle for second best. You may assume that store-brand value or economy products are cheaper because they are inferior, but often the only difference is that the packaging is cheaper. Embrace budget brands. Go to the supermarket less often. You'll be able to take advantage of bulk buying discounts, and you'll save time and money in the journey to and from the store. Using an online money manager software tool like Money Dashboard you can easily track how much you're spending on the supermarket each month. 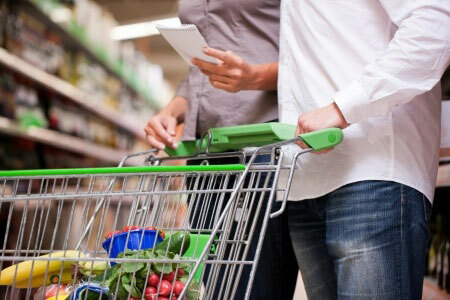 Getting some perspective on how much you spend on groceries will help you focus on budgeting to save. Have something to eat before you go to the supermarket. People buy more food when they're hungry, odd but true. If you have the option, walk or take a bike to the supermarket. Not only will you save on fuel, but you're less likely to overbuy if you have to carry it all the way home. Keep your head in the game! Supermarkets do a lot of research into figuring out the best ways to subtly influence you into spending more. Be aware that the smell of freshly baked doughnuts, the brightly coloured special offers and, the chewing gum and glossy magazines by the check-out are there to influence you. Only buy what you need and don't make impulse purchases. It takes a little bit of organisation, but if you plan out your meals in advance you can make sure that none of your food will spoil, and you'll know exactly what ingredients you need to buy, so you won't need to do any last minute purchases. You can also use websites like eattheseasons.co.uk to stick to seasonal and local produce, to keep costs down and make the most of what's available. If you're shopping online, check out mysupermarket.co.uk. You input your shopping list and they will compare prices across seven different high street store brands and order your shopping from the cheapest. You can also get cashback and discount vouchers for many purchases. With cashback websites like Quidco and Topcashback you can literally get money back on some online purchases, visit the sites to see their offers. Big supermarkets aren't always the place for the cheapest groceries. Fruit and veg is often cheaper at a local market. A butcher may be more expensive for some meat, but can give you advice on how to cook cheaper cuts. Finally, many household staples are cheaper to buy at budget supermarkets like Aldi or Lidl.